As you may know, I volunteer at a used bookstore every Saturday. 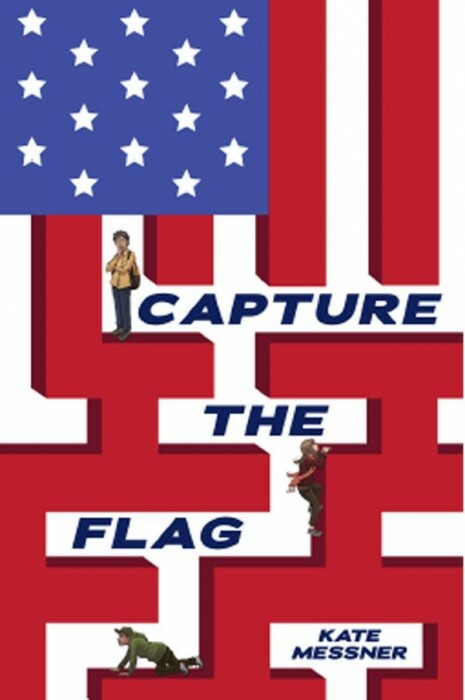 In my time there, I’ve seen several books in Kate Messner’s Silver Jaguar Society Mysteries series come and go, and I’ve always thought to myself, “I want to read that!” Well, I finally did myself a favor and picked up the first book, Capture the Flag. And thank goodness — because it’s a fun, action-packed read! In the book, we meet Anna, Henry, and Jose. They’re all snowed in at the airport together, but their connection is actually much deeper: All of their families belong to the Silver Jaguar Society, which has vowed to protect invaluable cultural relics and treasures at all costs — even if it means putting their own lives at risk, like by hunting down dangerous art thieves, for example. But Jose, Henry, and Anna are just kids, so they can’t get involved, right? Well, that’s what their parents would like, but then the original flag that inspired The Star Spangled Banner is stolen and the trio come to believe it’s hidden at the very airport where they’re stuck. I mean, how can they not get involved at that point? I enjoyed following Henry, Anna, and Jose’s adventures trying to recover the flag. The stakes are high because not only is the flag irreplaceable, but Jose’s mom is being held by police as a suspect in the theft. Plus, as they get deeper and deeper into the mystery, some threatening figures start to emerge and the trio find themselves in physical danger. I definitely stayed up reading this book a few times because I couldn’t wait to see what would happen next! But at the same time, I was never overly worried or spooked out by the story. To me, that’s the perfect amount of suspense. After you read Capture the Flag, you can check out Hide and Seek and Manhunt, the other books in the series. To my surprise, I liked Hide and Seek (Book #2) even more than the first book! Have you read any of the Silver Jaguar Society books yourself? Leave a comment with your opinion or submit a review! Or just tell me: If you were going to get involved in saving a priceless historical artifact, which one would you choose? Karen would be interested in a hunt for the Constitution. In terms of periods of American history, Karen finds the Constitutional Congress pretty fascinating. What a bunch of drama from some old men!